Rosegarden is a professional audio and MIDI sequencer, score editor, and general-purpose music composition and editing environment. It runs on Linux using the JACK audio system. 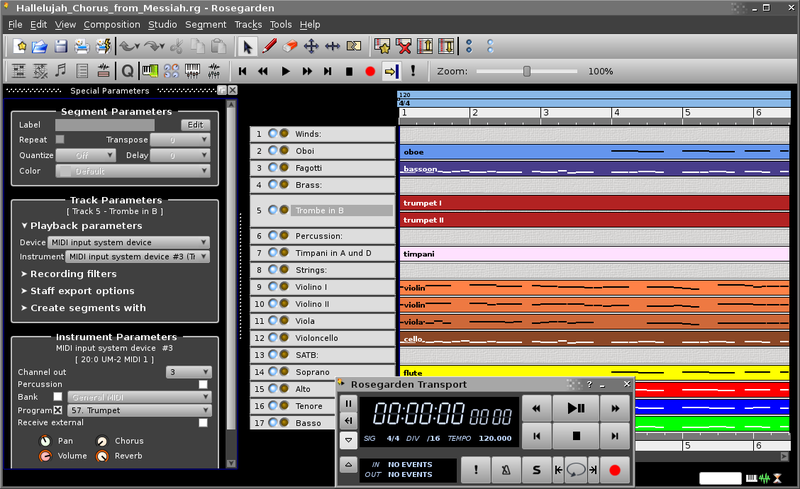 Rosegarden can be used to record and arrange audio and MIDI compositions with effects and instrument plugins. It supports LADSPA effects and DSSI instrument plugins natively, and hosts VST effects and instruments through the DSSI-VST wrapper plugin. MIDI and audio playback and recording with ALSA and JACK. Piano-roll, score, event list and track overview editors. DSSI synth and audio effects plugin support, including Windows VST effects and instrument support via dssi-vst. LADSPA audio effects plugin support. JACK transport support for synchronization with other software. Ability to build and run without JACK, for MIDI-only use. Score interpretation of performance MIDI data. Shareable device (.rgd) files to ease MIDI portability. Triggered segments for pattern sequencing & performable ornaments. MIDI and Hydrogen file import. MIDI, Csound, Lilypond and MusicXML file export. Clear, consistent and polished user interface. User interface translations for Russian, Spanish, German, French, Welsh, Italian, Swedish, Estonian, Japanese, and Simplified Chinese, as well as UK and US English. Help documentation available substantially or entirely translated into German, Swedish and Japanese as well as English. To record audio you will need an Audio Interface: See our review of USB Audio Interfaces here. Roundup of low-cost Studio Monitors for home recording & mixing. Choose among 0db, -3dB, -6dB panning laws for audio. Don't export certain properties in MusicXML that MusicXML can't handle. Fix #1387; export text events (e.g. lyrics) to MIDI. Fix #703; auto-beaming no longer does an extra unselected bar. Bugfix for minor notation layout issue. Bugfix for notation scrolling problem. Code cleanup, commenting, and simplification. Extensive reworking of certain aspects of the track editor to enhance performance, improve reliability, and reduce bugs. BugFix for a crash when adding a track after going from record to stop. BugFix for a crash on add track, undo, redo, load RG sequence. BugFix for a track label clobbering bug. BugFix for a bug where icons were not appearing on the instrument popup menu. BugFix for a bug where two tracks with the same instrument could be armed at the same time. Added some missing GPL license text. BugFix for a static init order bug that would cause playback to not work for some users. Handle tempo ramps during MIDI export. Handle ornaments during MIDI export. Handle repeated segments during MIDI export. New logical instruments that allocate channels on the fly. Segment create Anacrusis automates the steps needed to start pickup notes at precisely the right timing. SegmentSplitcommand ensures that two new split segments would be selected when a segment is selected before being split. Insertion / Playback pointer correctly advances in Notation editor when entered notes are split and tied. Several fixes to behaviour of track program/bank change sends in save/load and in interaction with percussion check-box. Permit shift-click on a track header to toggle selection of segments on that track without effecting other selected segments. Improve key highlights in matrix view so as to reflect current segment properly. Add support for basic LADISH level 1. Substantial fixes to audio file handling code to fix a number of problems with the wrong audio clip being played. Fix crash in some cases when opening file dialog if not using default Thorn style. Fix incorrect behaviour of frequency-range parameters in LADSPA and DSSI plugin editors. Fixes to missing-audio-file location logic. Shorten the factory autoload, removing the duplicate sets of tracks at the bottom so that all tracks initially are visible. Fix MIDI recording from devices in which note-on and note-off are not always cleanly paired. Fixes to positioning of playback pointer in matrix. Several substantial fixes to step-recording in matrix and notation. Several fixes to Lilypond export. Numerous fixes to segment editor corner cases that previously could introduce zero-length segments. Several fixes to corner cases that previously could introduce zero-length events or ranges. Fixes to unpredictable behaviour in certain operations involving copying segments. Numerous fixes to behaviour of editing operations in cases where segments overlap with the end of the composition. Make behaviour of Paste Range more predictable. Improvements to chord database and several fixes to fretboard editor. Fixes to avoid zero-duration note events in files. Fixes to toolbar visibility in editing views. Fixes to regressions in action availability. Fixes to updates in notation view, event list editor , matrix editor and rulers. Fixes to crashes and incorrect updating in the notation editor. Restore duration-change shortcuts in notation forgotten in 10.02. Fixed to configure process to permit user override of CXXFLAGS and improve platform compatibility. Minor improvements to desktop file definition. Posted by Peter Barber on Mon, 02/11/2008 - 21:33. LilyPond is great, but what about Rosegarden for OS X, please.